Key Difference: A seismograph is any instrument that measures motions of the ground, including those of seismic waves generated by earthquakes, volcanic eruptions, and other seismic sources. While, the Richter scale is a scale, ranging from 1 to 10, for indicating the intensity of an earthquake. According to the U.S. Geological Survey, there are as many as 1.3 million earthquakes in a year that humans can feel. This is without taking into consideration all the other small quakes that happen everyday, which humans don’t even realize. Of these million earthquakes, the majority take place in remote areas far from people and are often so low in intensity that most people would not notice. While there are many reasons for the earthquakes, ranging from meteor impacts and volcanic eruptions, to man-made events like mine collapses and underground nuclear tests, the most common reasons for earthquakes are the shifting of the Earth’s tectonic plates. However, rather than what causes the earthquakes, more importance is on how strong the earthquake is, how much damage can it cause, and how to best plan for it. In order to figure out when the next earthquake could be, there is a device known as the Seismograph. The seismograph or seismometer is an instrument that measures the motions of the ground, including those of seismic waves generated by earthquakes, volcanic eruptions, and other seismic sources. The records of the seismic waves helps seismologists to map the interior of the Earth, and to locate and measure the different sources of earthquakes. The first seismograph was designed by Zhang Heng of China's Han dynasty in the year 132 AD. It was called “Houfeng Didong Yi”, which literally means an "instrument for measuring the seasonal winds and the movements of the Earth" While, the device worked on the presumption that earthquakes were caused the direction, force, and timing of the winds, it still could predict the direction of an earthquake that occurred up to 500 km (310 mi) away. The plans of the original Zhang Heng’s seismometer were lost over time. However, historians and scientists have been able to recover enough information to be able to create a working model. Nonetheless, after 1880, most seismometers were descended from those developed by the team of John Milne, James Alfred Ewing and Thomas Gray, who worked in Japan from 1880 to 1895. After World War II, these were adapted into the widely used Press-Ewing seismometer. A seismometer has a weight hanging on a spring. Hence, it is sensitive to up-down motions of the earth. The spring and weight are suspended from a frame that moves along with the earthʼs surface. As the earth moves, the relative motion between the weight and the earth can be recorded to create the history of the earth’s motion. Changes in motion can be used to indicate the chances and intensity of an earthquake. However, this creates another issue: how to adequately describe the intensity of the earthquake. To combat this problem, a scale was developed to assign a number depending on the intensity of the earthquake. 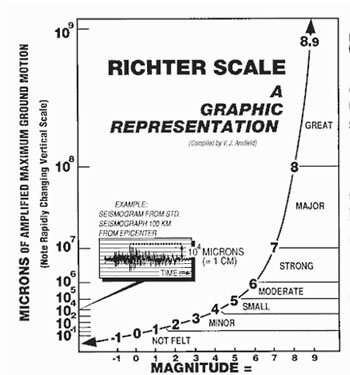 This scale was known as the Richter magnitude scale. It assigns the earthquake a number from 1 to 10 in order of increasing intensity. The scale was developed in 1935 by Charles Francis Richter in partnership with Beno Gutenberg. They both hailed from the California Institute of Technology. The scale was originally was to be used to only in a particular study area in California, and on seismograms recorded on only the Wood-Anderson torsion seismograph. However, eventually the scale was developed into a worldwide accepted standard. The Richter scale assigns the number on the basis of how much energy is released during the earthquake. The scale is a base-10 logarithmic scale, which means that an earthquake that measures 5.0 on the Richter scale has a shaking amplitude 10 times larger than one that measures 4.0, and corresponds to a 31.6 times larger release of energy. While the scale is usually considered to label from 1 to 10, and 0 being the basis to which the energy is being compared, the truth is that the scale does not actually have a lower limit. Many sensitive modern seismographs now routinely record quakes with negative magnitudes. Microearthquakes, not felt, or felt rarely by sensitive people. Felt slightly by some people. No damage to buildings. Often felt by people, but very rarely causes damage. Noticeable shaking of indoor objects and rattling noises. Felt by most people in the affected area. Slightly felt outside. Generally causes none to minimal damage. Can cause damage of varying severity to poorly constructed buildings. At most, none to slight damage to all other buildings. Felt by everyone. No Casualties. Damage to a moderate number of well built structures in populated areas. Earthquake-resistant structures survive with slight to moderate damage. Poorly-designed structures receive moderate to severe damage. Felt up to hundreds of miles/kilometers from the epicenter. Death toll can range from none to 25,000, depending on location. Causes damage to most buildings, some to partially or completely collapse or receive severe damage. Well-designed structures are likely to receive damage. Can be felt up to 250 km away from epicenter. Death toll can range from none to 250,000, depending on location. Major damage to buildings, structures likely to be destroyed. Will cause moderate to heavy damage to sturdy or earthquake-resistant buildings. Damaging in large areas. Felt in extremely large regions. Death toll can ranges from 1,000 to 1 million. Near or at total destruction - severe damage or collapse to all buildings. Heavy damage and shaking extends to distant locations. Permanent changes in ground topography. Death toll usually over 50,000. 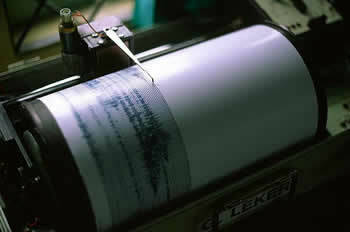 The Richter scale was developed to assign a single number to quantify the energy that is released during an earthquake. Seismograph is any instrument that measures motions of the ground, including those of seismic waves generated by earthquakes, volcanic eruptions, and other seismic sources. Any of various instruments for measuring and recording the vibrations of earthquakes. First developed in 132 AD, the modern ones are adapted from the ones designed between 1880 and 1895. The first seismoscope was developed by Zhang Heng. However, most modern ones are adapted from the ones designed by the team of John Milne, James Alfred Ewing and Thomas Gray, who worked in Japan from 1880 to 1895.